Clams: In ODFW study areas, the status of butter and gaper clams has improved since the last inventory (1979) while the status of native littleneck clams and cockles has declined. oysters present in multiple Coos estuary subsystems including particularly dense patches in the Upper Bay. Recreational Clam Data: Assessing the status of recreational clams in Coos Bay is made difficult by gaps and limitations in the data. For example, published records detailing the status of clams are often geographically limited or outdated. The most recent data are from the SEACOR study, which focused on only two of the Coos estuary subsystems (McCrae 2009). Prior to the 2009 SEACOR project, the next most recent data for clams date back to 1979 (Bottom et al. 1979, Hancock 1979). Additionally, methodological differences among the studies complicate status comparisons of clams in the Coos estuary. Direct comparisons are only possible where trends in the status of clams over time are clear and unrelated to methodological differences alone. The historical data provide general snapshots of clam populations at specific times in the past. The geographic and temporal spottiness of the clam data is understood and will be corrected when ODFW conducts more comprehensive SEACOR studies in the Coos estuary. Native Oyster Data: An assessment of the status of native oysters in the Coos estuary is subject to its own set of limitations. Although status data from Groth and Rumrill (2009) are geographically comprehensive, the data are qualitative, thereby making quantitative analyses difficult. 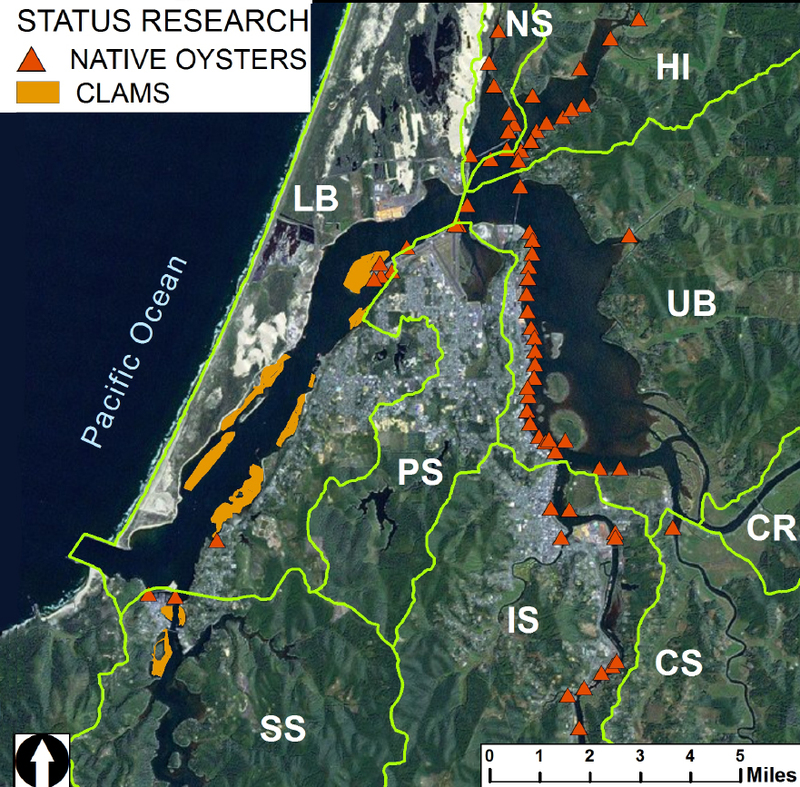 Furthermore, the status of native Olympia oysters in Coos Bay has been infrequently studied, though research is currently being conducted (e.g., 2012-13 OIMB Master theses) and will be included in this inventory when project results become available. 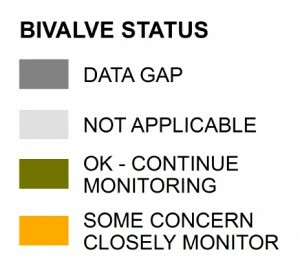 This section includes two data summaries: Recreational Clams and Native Oysters— which describe the status and trends (where the data allow) of bivalve populations in the Coos estuary. Data detailing the status of recreational clams are available for two of the Coos estuary subsystems (South Slough and Lower Bay). The most recent data come from the Shellfish and Estuarine Assessment of Coastal Oregon (SEACOR) project, which was conducted by the Oregon Department of Fish and Wildlife (ODFW) in 2009. Historic data describing the status of recreational clams from the 1920s to the 1970s are also available in published research documents, and collectively cover the remaining subsystems. 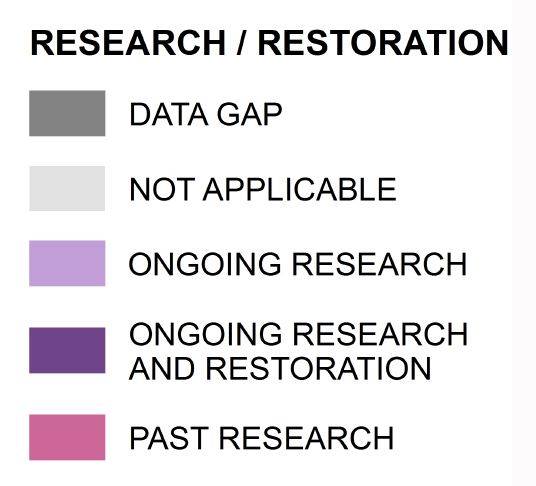 It should be noted that while these historic data are useful for providing insight into the status of recreational clams over time, they also present some challenges (see Data Gaps and Limitations). 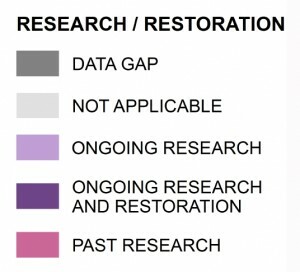 Some current data gaps will likely be filled when ODFW conducts more comprehensive clam monitoring in the Coos estuary again in 2014 or 2015. Information about the status of native oysters is relatively complete for subsystems with oyster habitat (all except the Catching Slough and Coos River subsystems). Most of the native oyster data summarized in this chapter came from a cooperative project between the South Slough Reserve and ODFW which resulted in a published paper describing the presence of native oysters in the Coos estuary (Groth and Rumrill 2009). Research conducted by the Oregon Institute of Marine Biology (OIMB) in the South Slough, Lower Bay, Haynes Inlet, Upper Bay and Isthmus Slough subsystems was also used. In addition, this chapter includes information about ongoing native oyster restoration efforts in the South Slough subsystem. Non-indigenous and invasive clam and oyster species in the Coos estuary are not addressed in this chapter. 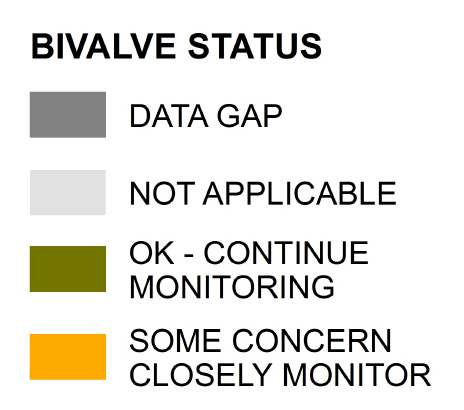 For the status of non-native bivalve populations, including species such as the purple varnish clam (Nuttallia obscurata), see Chapter 18: Non-Indigenous and Invasive Species. The status and distribution of commercial oyster cultivation, including the non-indigenous Pacific oyster (Crassostrea gigas) is also discussed in Chapter 18. Bottom, D. and B. Kreag, F. Ratti, C. Roye, R. Starr. 1979. Habitat classification and inventory methods for the management of Oregon estuaries. [Oregon Department of Fish and Wildlife final estuary inventory project report]. 84 pp. Groth, S. and S. Rumrill. 2009. History of Olympia oysters (Ostrea lurida Carpenter 1864) in Oregon estuaries, and a description of recovering populations in Coos Bay. Journal of Shellfish Research 28(1): 51-58. McCrae, J. 2009. SEACOR Shellfish and Estuarine Assessment of Coastal Oregon. Oregon Department of Fish and Wildlife, Marine Resources Program. Newport, OR.